Gluten free entertaining. How do you do it in a way that everyone can join in and enjoy and that your gluten eating guests don't steer clear of the gluten free food or avoid it like the plague. Whilst I can't start planning a wedding yet, as we don't have a visa - I can still come up with ideas. 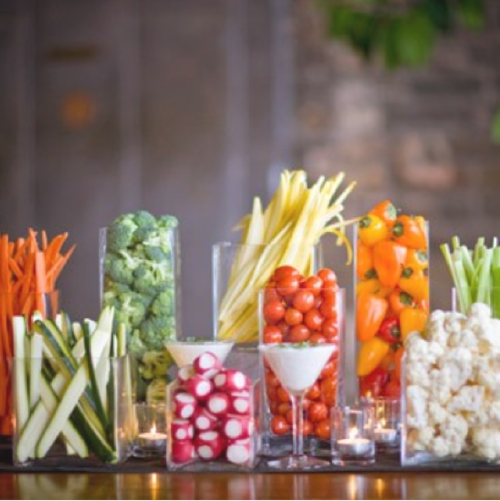 These days it seems like everyone has a food issue - so how on earth do you plan a wedding that will please them all? I'm going to start sharing little ideas here and there of wedding or party food options that can suit everyone! This idea of having a spud bar is awesome! You could do sweet potatoes and regular potatoes with a whole variety of toppings. My sweet potato loving heart is a-flutter with ideas! We always have veggie platters at our parties and I can never get them looking as nice as I want on a platter. This idea has my problem SOLVED! and I have vases just like those. Next party we have, this is definitely happening - and as the veggie loving person I am, this is so a wedding food option! So tell me - do you like to serve or be served? I have to say, I'm a self serve girl. I like to pick how much of each thing I want and know what I'm putting on my plate though sometimes it is lovely to be served!